The feature let your friends about your battery percentage and if the battery is low, they can find an alternate way to help you to reach the destination. Last year, Google introduced a feature in Google Maps that enabled users to share their location with others in real-time. This helps the recipient monitor as well as pinpoint the live location of a person who is on the move. It seems that Google has quietly released an update in the feature that will show the battery percentage of the smartphone from which the location has been shared. The update was first spotted by Android Police in an APK teardown of the Google Maps app in February. The feature is now reportedly being seen by several other users. When the recipient checks the contact’s location, he or she can notice a battery icon on the right of the ‘distance’ information. Interestingly, if the person is charging the phone during the travel, the battery icon will show a “lightning” symbol indicating the “charging” status. But what significance does this update hold? Consider a situation in which you are sharing your live location with your friends and your battery dies. Your friends will not be able to see your live location and wait for your response while cobbling up different reasons why your current location is not being shared. This feature will automatically tell your friends that your battery is about to die and they can devise an alternate way to actually guide you to the destination you are driving to. However, there is a characteristic associated with the feature that might go against you. 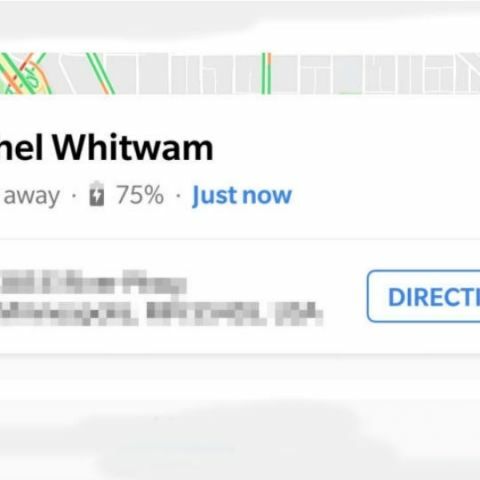 You might have to think twice before you lie to someone about your phone's battery life when you have already shared your battery status with your live location on Google Maps.